A short driving day yesterday and so we didn't get on the road until 10:00am or so. Still, it took us about 45 minutes just to maneuver our eight rigs out of the Casa Rayo del Sol RV Park in La Barrita. Nice spot, and we will stop in again the next time our travels bring us to this part of the coastline. But, despite the short distance of 69 kms (43 miles), it took us almost two hours to arrive at our destination. You never get anywhere fast in Mexico! Slow going through the several towns and villages along the way, and a couple of military checkpoints. We have never been stopped or boarded on this trip. We stopped the group at the side of the road just before Zihuatanejo so that one rig could get some propane. Normally, the propane trucks that come into the campgrounds can fill us all up, but one of our smaller motorhome uses portable 20 lb tanks and the propane trucks don't always carry the proper fittings to fill them up. So they need to stop at a propane filling station. 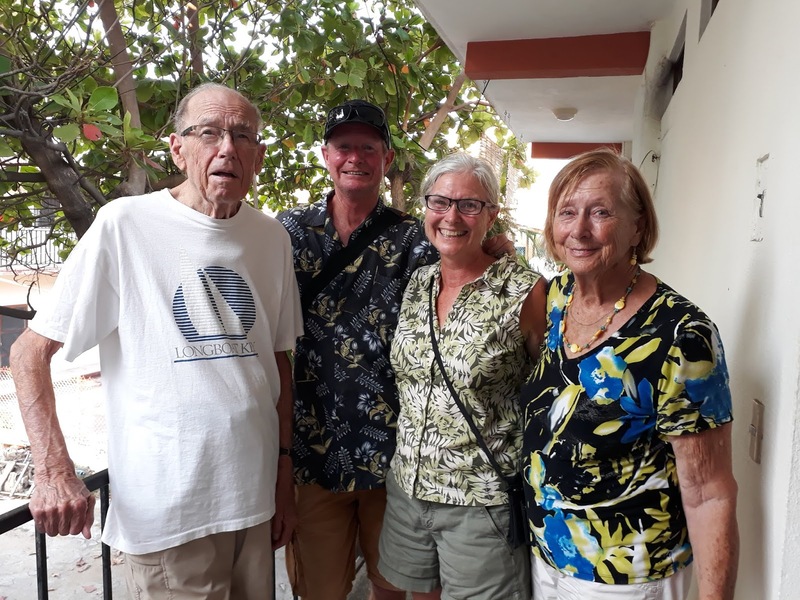 With that done, we continued through the fairly busy but easy to navigate main road in Zihuatanejo and north through the tourist resort property of Ixtapa. Like Huatulco and Cancun, Ixtapa was purposely built by Fonatur to be a tourist resort. There is not much there except for resort hotels and condominiums. But just north of that at Playa Linda is the Fonatur Ixtapa RV Park. Yesterday's drive, 69 kms (43 miles). We pulled in and there were only 4 other rigs here, all with Quebec licence plates. About 15 years ago, they built this big parking lot with 74 full hook up sites. It's a kind of a white elephant because it's so far away from everything that hardly anybody stays here. But, there is no other option in the area for a group of eight RVs traveling together. Sherman... at least he has lots of room! They did build a nice swimming pool though! But the beach in this area is not the best. 300 pesos ($15.75 USD, $21 CAD) per night with full hookups. This used to be a pretty expensive RV park, but the price has been the same for many years and now it's about an average price. But, it doesn't change the fact that it's too far away from anything. We had some lunch, and then a few of us took the local bus into Zihuatanejo. You have to walk 1.3 kms (half a mile or so) down to the bus stop from the RV park. Ruth and I left them at the big grocery store and walked into the central area to meet some long time friends. The parents of the best man at our wedding have been coming to Zihuatanejo for many years and we just happened to catch them here. They fly out today to visit their daughter in La Paz, so the timing was pretty lucky. Us, with John and Wendy. John is 88 years old now, and still travels! Wow! If Ruth and I can do the same, we've still got 30 years of travel ahead of us! We sat and chatted in a pub for a while, then met their friends Bill and Jan. By the time we left and walked out to get the bus back, there was no more bus back! We ended up getting a bus to Ixtapa. When we got there we were going to have to take a taxi, but the bus driver was at the end of his day and said "for 100 pesos, I'll take you there". So the bus driver drove us all the way to the RV park. It was kind of funny! Not sure what's on the agenda for today, but first thing we're doing is going for a bike ride. There is a nice paved bicycle path here, so we're going to do it before it gets too hot! Today only, buy a new Samsung Galaxy 9 phone, and get a free ($327) Samsung Tab Tablet! Wow, full hook ups. It would be a good day to give Sherman's black tank a real good flushing.